These houses are over 100 years old - what do you expect. These houses are over 100 years old - what do you expect? was the comment a builder made to the adjoining owner one Saturday morning after knocking a hole through the party wall into one of her bedrooms. The adjoining owner was very distraught as it had been arranged for her grandchildren to stay over on the Friday night but, luckily, had been cancelled at the last minute. She could not help but think about what might have been, as their bed was directly below the hole where the bricks had been out. When opening the roof dampness got into the ceiling.as they did not afford adequate protection. They have also caused other damage during the course of removing chimney breasts. 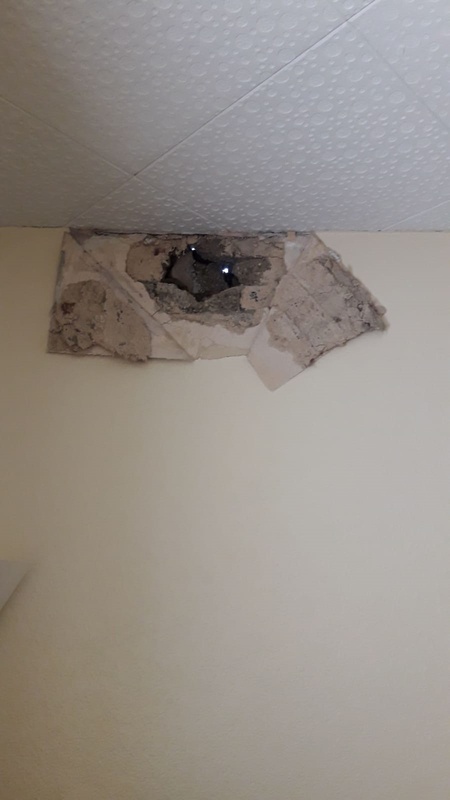 The ceiling will have to be re-boarded with plasterboard and skimmed, the whole room will have to be redecorated and other remedial works carried out. The final cost has yet to be established, the surveyors costs have mounted up already. I will publish the costs once known. It is the Building Owner who is directly responsible to the Adjoining Owner, so it is treated as if had caused the damage himself and will have to try and recover the costs from his contractor. Lee recently had an article published in the Faculty of Party Wall Surveyors quarterly magazine. The article looked at whether there is a necessity to serve notice on all Adjoining Owners and / or Occupiers. The view taken by Lee looks at the requirements of serving notices from a different angle. This approach was recently adopted in regard to a property which was divided into flats. There were threats of an injunction but they never materialised as one of the Adjoining Owners realised they were on an uphill struggle. I was recently asked by the Building Owner to assist in a matter where their surveyor had died. Apparently he was a really nice guy. I requested all the current documents to be emailed to me and I duly received two awards. I had been informed that the surveyor had been paid in excess of £2k. The works consisted of a single storey rear extension and a loft conversion. The 'Award' announced the surveyor as 'agreed surveyor' appointed to act on behalf of all parties. It then goes on '.... the surveyor so appointed has selected Mr ........ to act as an 'independent' surveyor in accordance with the Act..... and if the two surveyors are unable to agree; a 'Third Surveyor' will be selected in accordance with section 10(8) of the Act.' This is totally wrong, he has tried to create an agreed surveyor award from a two surveyor award. The 'Award' referred to Sections 1, 3 (2.2) & 6. It referred to the notices which had been verbally served by the Building Owner. No drawings were handed over. The works referred to, only related to the rear extension, no mention of the loft conversion. This award could create more problems than it purports to solve and could cost the parties a lot more money in the event of a dispute arising. Lee Kyson was contacted by the adjoining owner (AO), in February 2016, as while she was away the neighbouring building owner (BO) had carried out notifiable building works without serving notice and causing damage and trespass of foundations inter alia to the AO's property. Having been appointed to act on behalf of the AO, Lee contacted the BO requesting that they appoint a surveyor under section 10(4)b of the 'Act', also offering to act as agreed surveyor. The BO promptly instructed a solicitor. On expiration of the 10 day notice period Lee sought to appoint a surveyor to act on behalf of the BO. Despite having spoken to several surveyors they did not wish to accept the appointment as it was the AO's surveyor making the appointment. Finally a surveyor accepted the appointment. This led to a protracted bout of correspondence between the parties. An award was finally served in August 2016 dealing with the damage caused by the BO, compensation to the AO, surveyors fees, legal costs, Arboriculterist's fees.... total £17,000. Despite continual threats the 'Award' never was appealed.